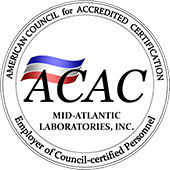 It is easy to do business with Mid-Atlantic Laboratories, Inc. (MAL). Call a sales representative at 804-742-5577 or email midatlanticlab@gmail.com with any technical questions you may have. MAL has recently added an Online Shopping Cart to make ordering all the more convenient for our customers. Clicking here or the shopping cart on the left takes you to the area in which to order. Ordering is fast, safe and secure. The following explains how MAL typically gets you the analytical results you need. After determining the scope of your analytical project, determine if this work is regulatory driven, i.e., do you need a state certified lab for this work? 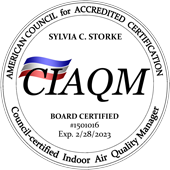 MAL is approved by the Environmental Protection Agency (EPA), the Virginia Department of Environmental Quality (DEQ); and certified by the Division of Consolidated Laboratories (DCLS) in four states – Virginia, West Virginia, Maryland, North Carolina and will soon be certified by the "National Environmental Laboratory Accreditation Program" (NELAP). Get a quote from an MAL sales representative. A quote is usually derived from the analytical testing you need to do for some regulatory purpose, but not always (MAL analyzes many samples for "study" purposes or “health” reasons). The regulations that drive the work you need will typically list the "Method Detection Limit" necessary for the sample testing you are doing. For example, since sample analysis and remediation under the "Clean Water Act" (CWA) is different from "Resource Recovery Conservation Act" (RCRA), then the analyses you request will probably have different detection limit requirements and therefore the quote price will be different. Other factors that determine the final quote price can be your requested turn-around-time (TaT) - or - how fast do you need your data, and the level of quality control reporting required for your project. After the quote is accepted and you have settled on the sampling date, a bottle (or sample container) order is sent to your sampling location, packed in coolers with all necessary paperwork. Your samplers are required to follow the method protocol for your sampling event, such as field filtering or pH testing. Then, complete the Chain of Custody (COC) and send all back to MAL, preferably overnight shipping or delivery, so method stated hold times allow us to complete the work in a timely fashion. MAL assigns a project manager to your project. This will be your MAL contact while your work is being completed. MAL completes the analysis of your samples following EPA requirements. If samples do not fall within quality assurance limits, the sample(s) will be retested. Analytical reports are generated in Microsoft Word and sent via fax or e-mail for the fastest possible turn around and easy report distribution. For corporate accounts an invoice is generated and sent to your specified billing contact.